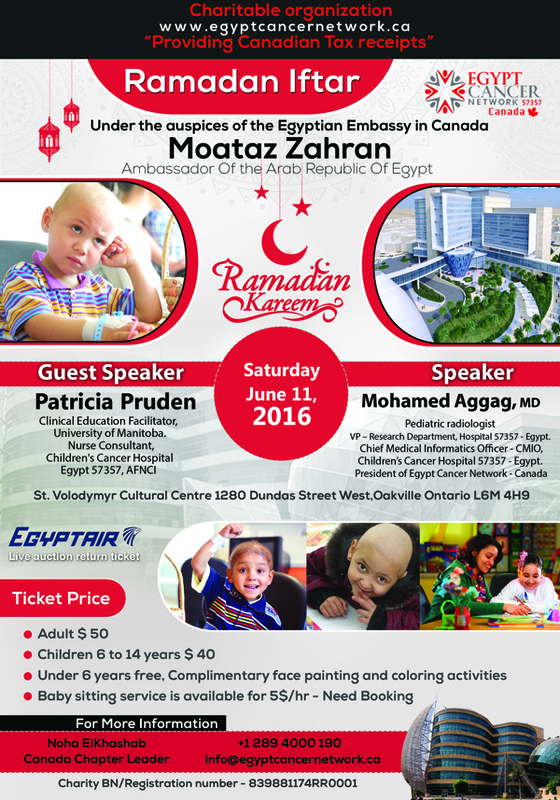 Egypt Cancer Network (ECN) is a Canada based non-profit organization that focuses on raising funds to provide free state of the art cancer treatment to Middle Eastern children in Egypt. Each for Children. Only donations made at this event will be tax-deductible and will be donated to Children’s Cancer Hospital of Egypt 57357. Babysitting will be available for $5.00/hr Need Booking per child for children 6 and under at the venue. The event will commence at 8.00 pm with a registration, followed by Iftar and the main event. To Purchases your Ticket, Please Call Noha Elkhashab At 289-400-0190 to Reserve your tickets.